The 2018 CMA Awards show was full of huge moments and big performances! Enjoy watching Keith Urban's acceptance speech and more here! The 2018 CMA Awards ceremony has already come and gone, but what a night! Chris Stapleton took home three wins, while Keith Urban graciously accepted the coveted Entertainer of the Year honor. Country stars Brad Paisley and Carrie Underwood co-hosted the annual event, which aired live from Bridgestone Arena in Nashville Wednesday, Nov. 14 via ABC. Luke Bryan then performed “What Makes You Country,” and welcomed rising country stars Luke Combs, Lindsay Ell, Chris Janson, Ashley McBryde, Jon Pardi, and Cole Swindell. Ell shredded during her guitar solo, Janson rocked on the harmonica, and Combs, McBryde, Pardi and Swindell joined in on vocals before all seven artists united center stage to close out the first performance of the night. Thomas Rhett took viewers through “Life Changes” as he moved from the stage to the audience before the entire Ravenwood High School Marching Band from Williamson County, TN made their way to the stage. They were then joined by Thomas Rhett for the grand finale as he jammed on one of the student’s drums while sparks showered the stage. Vocal Group of the Year winners @OldDominionMusic left their heart on their sleeves and everything they have on the #CMAawards stage. Check out their performance of “Hotel Key”. Did you miss the #CMAawards last night? Watch it On Demand with the @ABCNetwork app and on @Hulu! Urban, in complete shock of winning Entertainer of the Year, thanked his wife Nicole Kidman and barely held back tears as he acknowledged everyone on his team. Watch his emotional acceptance speech below! 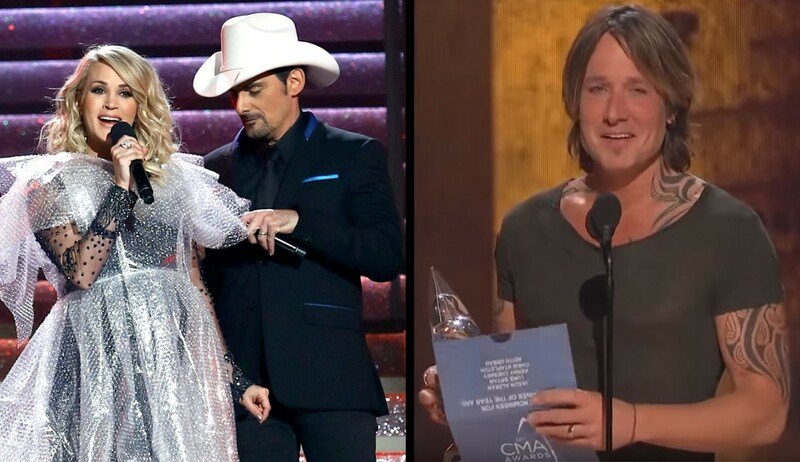 Share these 2018 CMA Awards highlights with other country music fans!